Insidious: The Last Key, the fourth movie in the Insidious franchise, haunted us with a dreadful film. Insidious: The Last Key takes place right after the end of Insidious: Chapter 3 when Elise Rainier, a gifted psychic, walks off with Specs and Tucker, her two partners, creating their new company, Spectral Sightings. The movie goes on to tell the story of Elise receiving a call for a job at her childhood home that still haunts her in her dreams. She and her two partners travel to her hometown to destroy the demon that she accidently released years ago as a child. Elise doesn’t just come back to her past demons though, she also meets her brother’s daughters, and one has inherited Elise’s power. The movie intended to make the storyline of Elise’s past and how she had trouble with her physic powers an emotional situation, but the feelings and the passion was not there. The entire film lacked the sentimental moments to get the audience invested. For example, the reunion of Elise and her brother was nothing more than a few lines being read out–there was no feeling into the words said, caused by the dryness of the lines and acting, and all of the flashbacks with Elise being abused by her father didn’t give the audience all it could of. 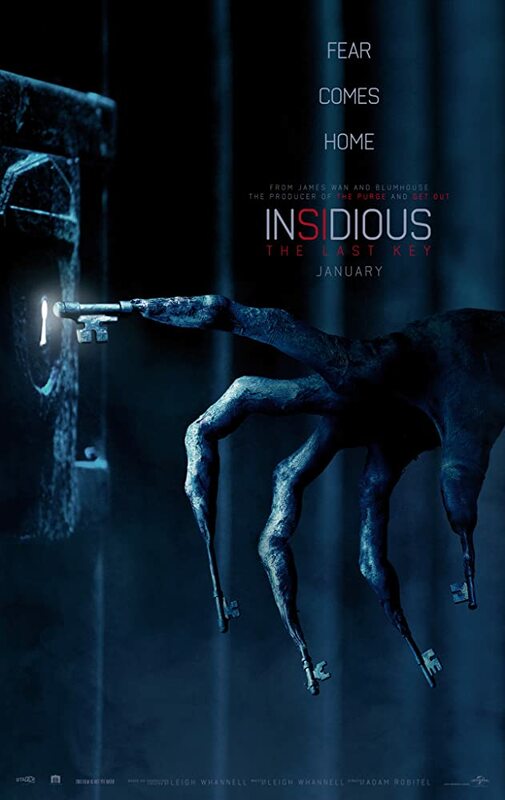 Unlike the other Insidious movies, which had a storyline that connected the audience to the characters (which ultimately made it more terrifying for all those involved), Insidious: The Last Key tries to follow in the footsteps of its predecessors but only manages to come up with a couple of spooky scenes at best—including one in which Elise makes a startling discovery inside a tube-shaped air duct. But the movie mostly relied on loud noises and predictable jump scares. Naturally, the film was not all bad, as it did have a handful of redeeming moments. Insidious: The Last Key, had a solid cast that showed of their acting skills such as Lin Shaye, Leigh Whannell, Angus Sampson, and many others. The film also had surprised twist and turns throughout the film leaving the audience to pick up on the clues. In the flashback to Elise’s childhood, Elise’s brother had a whistle, given to him by his mother, to blow whenever he would be scared so his mother would come back and protect him. Near the end of the movie the same whistle was used by Elsie to escape the evil deity and her mother’s spirit came to the rescue. Also, the film surprised the audience by adding the fact that Elsie’s niece had the same power as her, which was helpful at the end. Insidious: The Last Key was a film that had the potential of being something more than what it was. Its lack of emotion and thrilling sensation made the movie lose the brilliance behind the storyline itself and the amazing acting that was contributed.